Every month, The Little Corporal devoted a column to charades and puzzles. 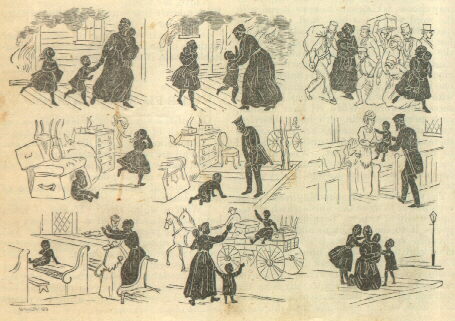 One popular feature was a series of illustrations, for which subscribers were invited to write a story. Not surprisingly, the “picture story’ didn’t appear in the first two issues printed after the Chicago Fire, but returned in January 1872 with a story based on the Fire. Here you’ll find the editor’s comments, the illustrations, and—a discreet distance down this page—the story created by a young reader. Our Picture Story for this month was suggested by one of the incidents of the great fire. We should be pleased to have some one send us a good translation of it in time for the next number. It should reach us by the tenth of January. We would also request our readers to send letters to Prudy’s Pocket, and games, charades, and puzzles for Private Queer’s Knapsack. The fearful fire was raging, and Mrs. C— and her three children, Minnie, Frankie, and baby Charlie, had barely time to escape. But Frankie was hardly more than a baby himself, and his weak limbs soon gave out. After a hasty consultation, it was decided that Mrs. C— should carry Frankie and Minnie should carry the baby, and keep as close together as possible. But the crowd was hurrying them on, and they had all they could do to keep from being trodden under foot. When Minnie looked up she could see nothing of her mother and Frankie. Fortunately, she got out of the crowd, and hardly knowing what she did, sat baby on the walk near some goods that had been rescued from the flames, and started off, hoping to find her mother. Charlie, finding himself alone, began to cry; but soon started on his hands and knees to see what he could find, when a policeman seeing him with no one to care for him, picked the little fellow up and carried him to a church which had been opened to house the people whose homes had burned, where he was kindly cared for. Mrs. C— and Frankie got into the church, also, never thinking of finding baby there, whom she had given up for lost; and great was her joy on beholding her baby boy sitting in a pew sucking his thumb as complacently as could be. In the meantime where was Minnie? Mrs. C—, not content with leaving the others behind, took them both and sallied out to find the missing one; but she had gone but a little way when she saw her seated on an express wagon. The man stopped his horse, Minnie got down, and they were united once more. The poor woman’s heart was so full that she kneeled down, and there, on the cold pavement by a lamp-post, thanked God that although her worldly goods were burned her children were yet spared to her.